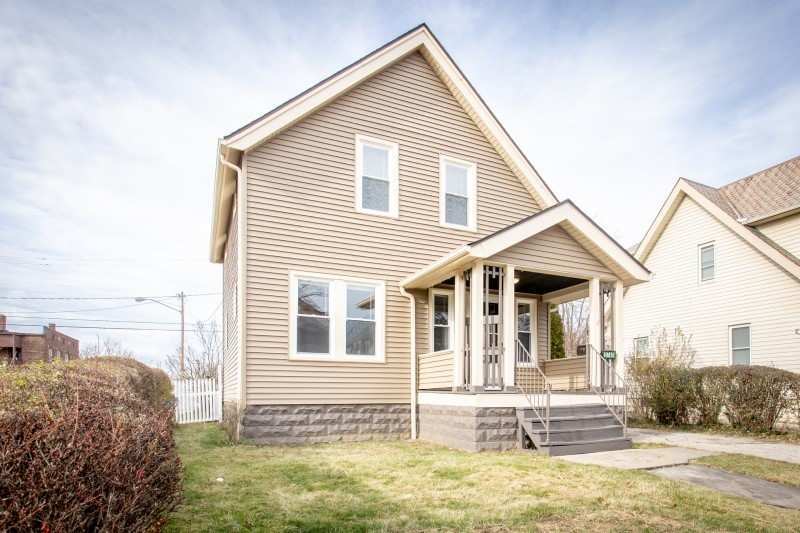 You’ll find this charming colonial home, with its fresh new update throughout, to be the perfect first home or investment property. The front door opens into an inviting living room with beautifully textured new flooring that continues into the formal dining room. The bright and modern kitchen has everything you’re looking for. Its white shaker cabinets give you plenty of storage and light quartz countertops will make cooking a dream. There is also a stylish tile backsplash, new stainless steel appliances and room for a cafe table for your morning coffee or a chic island counter for more meal prep space. Upstairs are the three bedrooms with soft carpeting, warm natural light and closet space and access to an upper floor airing porch. The full bathroom is also upstairs and has been given a contemporary makeover with stylish updated tile. The full size basement has got plenty of space for laundry, storage and even a convenient work area. The home also has a large fenced in backyard, a spacious two car garage, new replacement windows and a newer roof. Don’t miss this chance!